This mode shows custom columns as specified using Columns property. You can show resources instead of days on the horizontal axis. You can show discontinuous sequence of days on the horizontal axis (e.g. Monday, Wednesday, Friday). Use fixed column width to add a horizontal scrollbar when displaying a large number of resources. 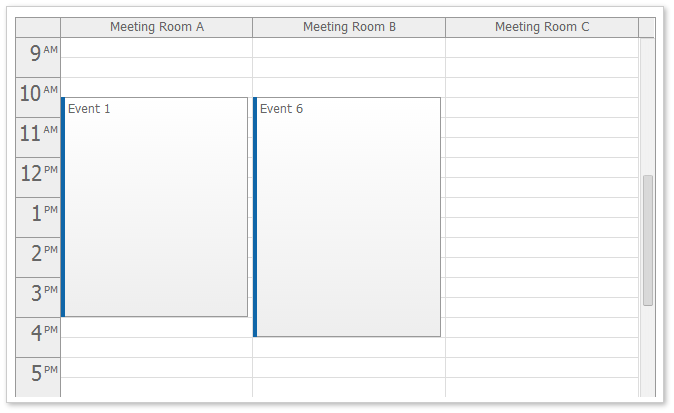 In order to display the events in the correct column you need to specify the resource for each event (resource property). In order to display the events in the correct column you need to specify the resource for each event (DataColumnField). The Columns can be defined in the .aspx file. You can also define the Columns in the code behind. In order to display the events in the correct column you need to specify the resource for each event (DataResourceField).